The park is open daily from 8am. to 5pm., with the day's final admission at 4pm., one hour before closing time so the last-admitted guests of the day have a full hour to explore the gardens and trails. A variety of plants from the world's deserts await you at Boyce Thompson Arboretum State Park. The Arboretum was founded in the 1920s by mining magnate Col. William Boyce Thompson. In 1917 Col. Thompson served as co-leader of a Red Cross mercy mission to Russia, where he came to understand the importance of plants as the ultimate source of a large portion of mankind's food, clothing, and shelter. It was then, that he determined to use his great wealth to improve the use of plant resources. The Arboretum is one of his legacies. 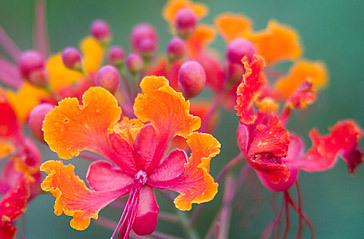 Encompassing 323 acres, the Arboretum is Arizona's oldest and largest botanical garden. It was the first purely botanical institution in the inter-mountain states. The Arizona State Parks Board entered into agreement with the Boyce Thompson Arboretum Board and the University of Arizona in 1976 to cooperatively manage the Arboretum. The University of Arizona also maintains a website for this park, with additional park information and photos. Learn more.